In the beginning of February 2019, following statements from Swedbank to U.S.-based regulators, the financial authorities in Sweden and Estonia announced the opening of an investigation into suspicions of money laundering concerning Swedbank. These investigations began following revelations that Danske Bank had been channeling money through its Estonian subsidiary. In all, Swedbank may have channeled up to EUR 20 billion in questionable funds through its Estonian unit each year between 2010 and 2016, according to the Swedish public television channel (SVT). However, most damningly, SVT revealed that many of these transactions actually passed between Swedbank and Danske Bank. On Wednesday, March 27, 2019, Swedbank stock plunged by 11.9% following a raid at Swedbank’s headquarters by Swedish authorities, with Swedbank losing more than a fifth of its value since the revelation of the connections between Swedbank and Danske Bank. Subsequently, three of Swedbank’s top five shareholders, including AP1 and Alecta, announced their decision to vote against the resolution granting the CEO discharge at the company’s upcoming AGM. However, the decision of the Swedish Authority Against Economic Crime to extend its investigation of money laundering allegations and to also address allegations of fraud by the bank proved to be the coup de grace. Following these announcements, CEO Birgitte Bonnesen faced the shareholders of Swedbank on March 28, 2019 in a pre-AGM meeting in which at least three of them made it clear they have lost total confidence in her due to this scandal. As a result, Swedbank dismissed Ms. Bonnesen just one hour before its AGM of March 28, 2019. While many companies have seen a revolving door of CEOs following a series of scandals and controversies, the linkages between the two banks, as well as the regulatory agencies in charge of their oversight, begs the question of who is really monitoring the executives at the largest banks in Scandinavia? This decision also brings echoes of ex-CEO Michael Wolf being asked to step down from his position in 2016, after a Swedish newspaper exposed the involvement of two senior members of its management team in a conflict-of-interest case surrounding property dealings. Most strikingly, however, may be that, as most of the transactions took place during the tenure of Michael Wolf, Ms. Bonnesen has paid the price for a lack of oversight more rightly attributed to Mr. Wolf. Most concerningly, however, is that the ramifications of this scandal and the resignation of Ms. Bonnesen leads to another blow in the efforts to seek greater gender equality not just in the boardroom, but also in the C-suite. 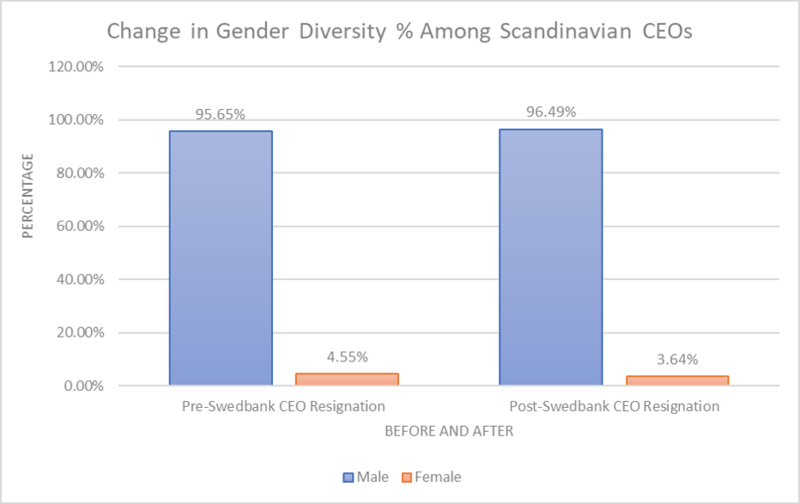 Utilising CGLytics’ proprietary database and analytics of executives and directors for the largest-cap companies in the Scandinavian region, we find that Ms. Bonnesen’s departure leads to a drop of almost an entire percentage point among Scandinavian female CEOs, a number that was already low to begin with (five female CEOs in 2018 versus 110 male CEOs) in 2018. Having a pro-active succession plan in place, with a queue of candidates with the necessary qualifications and skills required of such a high-level position, is already a daunting task. At Swedbank, in both recent scandals where the CEO stepped down, this position was taken by the CFO on an interim basis because the board seemingly had no other candidates at hand. Companies seeking to increase their gender diversity at the board and C-suite level, as well as to assure stability during executive leadership transitions, require the tools to find highly-qualified candidates. This proves particularly true when unforeseen circumstances like the Swedbank scandal knock one of the already few such candidates out of their position.